We should've known better than to doubt the unrelenting work ethic of Måns Zelmerlöw. After reading the ever-loving daylight out of the ghastly single cover and then the lyric video (though in our defence, that was when we thought that this was all we'd have as opposed to a proper music video), Zelmerlöw has delivered a solid visual narrative to his follow-up single, "Should've Gone Home." While the lyrics spin a tale of a man regretting his foray into infidelity, the music video delivers a surprisingly eerie twist on what could have been an echo of songs already sung by others. 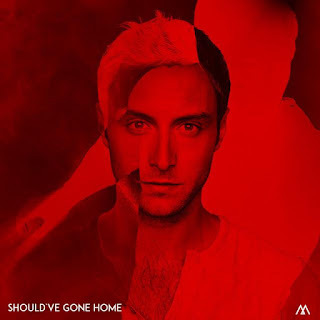 Much of the video shows Zelmerlöw moving in reverse from his confrontation with his jilted lover back through his drunken shenanigans to his decision to go out for a night on the down. That, or he is moving at a normal pace while those that surround him, be it Swedes or raindrops, move in reverse. The eeriness climaxes with Zelmerlöw's sit-down with himself as his lover's voice delivers whispered words, still in reverse. If the video-makers had only upped the ante a bit more, we'd have had a full-fledged horror classic on our hands. We always have to commend Swedish artists for getting a video out to go with their singles, as Swedish labels are rarely willing to cough up the budget to get one made. But if a 3rd-highest-points-ever Eurovision victory isn't enough to get you a music video, then what is? (Though we'll forever be waiting for a music video for "Heroes" ~ Darin took years to get one out for "Nobody Knows" so there's still room for hope, people). Only time will tell as for what other singles (and hopefully more music videos) will be released from "Perfectly Damaged." Of course our greatest hope is that "Someday" will be one of the elite, chosen ones. Come on now, "Fire and Gasoline"? That video concept has all but written itself!